ABS-CBN emerged as the most awarded TV network in the University of Perpetual Help-Las Pinas Alta Media Icon Awards, raking in a total of 48 recognitions for its news and entertainment shows, and personalities. The news and public affairs arm of ABS-CBN won 15 awards including Best TV News Program for its flagship news program “TV Patrol” and Best AM Radio Station for DZMM Radyo Patrol 630. Among the winning programs and personalities honored include “SOCO” (Best TV Documentary Program), “Umagang Kay Ganda” (Best Morning Show), “The Bottomline with Boy Abunda” (Best TV Talk Show), “The Score” (Best Sports Program), “Dos Por Dos” (Best AM News Program), “Kabuhayang Swak na Swak” (Best Educational Program), Julius Babao (Best Male TV News Personality), Bernadette Sembrano (Best Female TV News Personality), Amy Perez (Best Morning Show Host), Kim Atienza (Best Educational Program Host), Anthony Taberna (Best TV News Talk Show Host and Best Male AM Radio Personality), and TJ Manotoc (Best Sports Program Host). The network’s entertainment television shows also ruled the Alta Media Icon Awards as it picked up awards for “Maalala Mo Kaya” (Best Drama Anthology), “It’s Showtime” (Best Noontime Show), “ASAP” (Best Musical Variety Show), “Wansapanataym” (Best Youth-Oriented Program), “Magandang Buhay” (Best TV Showbiz-Oriented Talk Show Program), “Ipaglaban Mo” (Best TV Public Service Program), “The Greatest Love” (Best Daytime Drama Series), “Minute to Win it” (Best Game Show), and“The Voice Kids” (Best Reality/Talent Competition). Meanwhile, ABS-CBN’s flagship FM station MOR 101.9, was named Best FM Radio Station and took home awards such as Best FM Radio Program (Dear MOR 101.9) and Best Female FM Radio Personality (DJ Cha Cha). Other Kapamilya winners come from Star Music, which includes Song of the Year (“Dahil Sa’Yo” by Inigo Pascual), Best Male Recording Artist (Darren Espanto), and Best Female Recording Artist (Jona). Kapamilya stars also dominated the Alta Media Icon Awards including Primetime King Coco Martin (Best Drama Actor for TV), Jodi Sta. 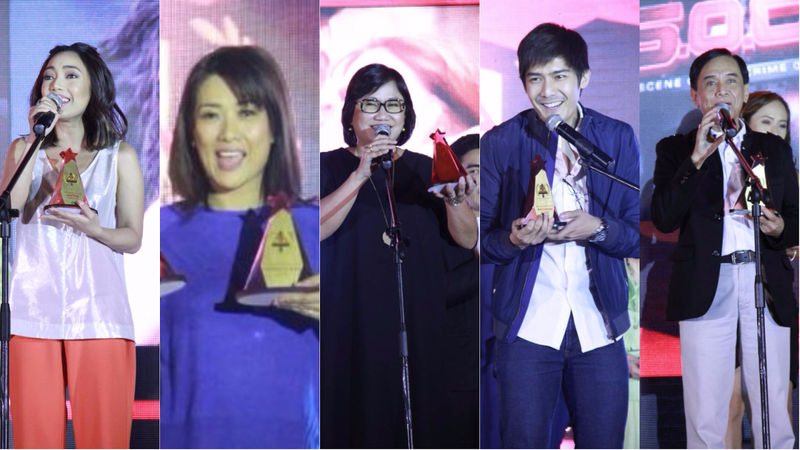 Maria (Best Drama Actress for TV), LizQuen (Best Love Team), Luis Manzano (Best Game Show Host), Robi Domingo (Best Reality/Talent Show Host), Billy Crawford (Best Variety Show Host), Karla Estrada (Best TV Showbiz-Oriented Talk Show Host), Angelica Panganiban (Best Comedy Actress for TV), McNeal “Awra” Briguela (Best Child Actor for TV), Xia Vigor (Best Child Actress for TV), Ian Veneracion (Most Influential Male TV Personality), Anne Curtis (Most Influential Female TV Personality), Susan Roces (Iconic Media Personality for Film and Broadcast), and Rey Valera (Iconic Media Personality for Music).